My father, being of the solid German stock that he is, is naturally a connoisseur of all things potato. In particular, he loves nothing more than very crispy, shredded homemade hash browns for breakfast with his eggs. Now, there are many ways of frying up potatoes for breakfast, and I think we do all of them. But the shredded variety of hash browns holds a special place in his heart (mine too!) and for that reason, he has mastered the way to make them extra crispy. ME: Dad, how do you make your hash browns turn out so crispy? DAD: Use a potato ricer. It’s the only thing I’ve found that really gets the moisture out of the potatoes. The trick to these hash browns is to get rid of as much moisture as possible before cooking them. MOM: I always used paper towels to press out the moisture. DAD: Your hash browns are mushy. MOM: I made this family hash browns for forty years and you never complained. They’re perfectly fine. DAD: Yes I did. And they were mushy. Mom’s hash browns are mushy. Tasty, edible, yummy, but still mushy. They aren’t as good as dad’s, and that is just a fact. The trick to great, crispy, shredded hash browns is to squeeze as much of the moisture out of them as you can! Then you need to make sure you are using enough oil, the pan is hot but not so hot as to burn the potatoes, and you spread the shredded potatoes out in an even, thin layer, the thinner the better. What follows is my dad’s way of making hash browns that turn out perfectly crispy and absolutely delicious. 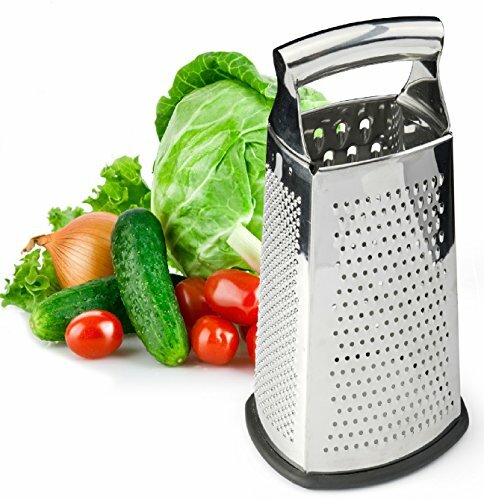 1 Peel and grate the potatoes: Peel the potatoes and grate them using the large holes of a box grater. 2 Squeeze out the moisture: Squeeze out as much moisture as you can from the grated potatoes. An easy way do this with a potato ricer, using it much like you would a garlic press, except you don't force the potatoes through the ricer. You just press out the moisture. Work in batches and only fill the ricer half-way with the raw grated potatoes. If you don't have a ricer, wrap the raw grated potatoes in a clean kitchen tea-towel and squeeze it until you have squeezed out as much moisture as you can. Work in batches to make it more manageable. Note that the potatoes can sometimes stain a cloth towel, so use one that you don't mind showing a bit of wear. You can also use sturdy paper towels to squeeze out the moisture, though they don't work as well as cloth or a ricer. 3 Heat oil in pan, spread out grated potatoes: Heat 3 Tbsp of oil in a large frying pan on medium-high heat. When the oil in the pan heats up to the point of shimmering, but not smoking, add the grated potatoes, spreading them out along the bottom of the pan. The potatoes should not be too thick in any one place, a 1/4-inch to a 1/2-inch thick. Sprinkle some salt and pepper on the potatoes. 4 Flip the hash browns: After a few minutes, lift up one edge of the potatoes and see how done they are. If they have fried to a golden brown they are ready to flip. Use a large metal spatula (or two spatulas) to flip the potatoes over all at once, or divide the large potato cake into halves or quarters and flip. Continue to cook until they are golden brown on the bottom. Hello! All photos and content are copyright protected. Please do not use our photos without prior written permission. If you wish to republish this recipe, please rewrite the recipe in your own unique words and link back to Crispy Hash Browns on Simply Recipes. Thank you! Thanks Lady. Some of the simplest foods are the hardest to make I swears. Lemon squeezer does same as ricer, but just water comes out, then put potatoes in bowl. Works great and don’t have to buy ricer. Just clean very well so no lemon taste. Great idea M, thank you for sharing! I parboil before shredding. Works that way too. Finally I made some decent hash browns! It’s easier to simply shredded potatoes and do a quick parboil then pat dry shredded potatoes. The trick is to remove the starch potatoes become very sticky with excess of starch. The Little bit of water that’s left in the pan just steams off very quickly in a hot pan. Looks good. Need to try them thanks. Ok a bit confused. The recipe calls for potatoes. Does not say to cook them first. Yet several comments from others say to microwave the potatoes, cool, and then grate them. Why? Thx. Hi Valerie, good question! Our recipe calls for using raw potatoes. If some readers prefer to try cooking the potatoes first, then that’s up to them. To add to what one man said, I’m going to get a baking sheet and line it with kitchen towels. Then spread out the grated potatoes and place more kitchen towels over them. Then place a baking sheet over this. Put it on the floor and stand on it!! Keep replacing the kitchen towels until all dry. I simply grate the potatoes onto paper towels and then press them with more paper towels before frying them. Works very well. I REALLY enjoy eating the skin of baked potato – so why peel them? Isn’t the skin supposed to contain lots of “good stuff”? Use a Salad Spinner to centrifuge the water out of the potatoes. NOTHING works better than this. I use the OXO from Target for 30 bucks but there are cheaper versions out there. 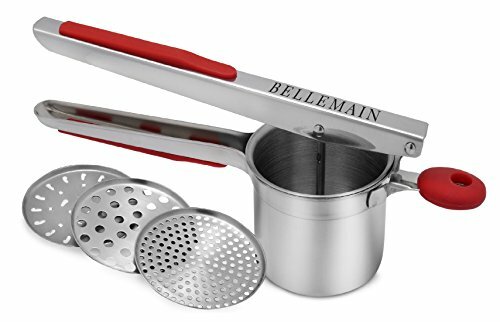 It’s a no brainer device and doesn’t harm the integrity of the shredded potatoes like squeezing in a ricer or cheesecloth. Horrible craving for hash browns this am, didn’t have any frozen. My potatoes were a little soft, but the craving was so intense. Decided to give it a try. There are just two of us, so took 3 small russets out. Washed and poked them, microwaved for 2 minutes, peeled when they were cool enough to handlel. Shred in food processor with “M” disc (largest), Immediately soaked in ice water. Let sit, used ricer to remove water and dried on paper toweling. Meanwhile, got 1/8″ sunflower oil + tbls. butter very hot. Covered bottom of pan with shredded potatoes and waited until they were a golden brown. Flipped over, added a little more butter, salt and peppered. Okay, all this to say. We will not be going back to frozen! They were amazing. THANKS FOR THE RECIPE AND GOOD SUGGESTIONS! I don’t own a ricer or food processor. Nor can I afford either of those things. I am on disability and only bring in $700 a month, it’s my only income right now. What are some other suggestions besides squeezing the potatoes in paper towels? I’d like to be able to get them as dry as possible. TIA for your suggestions. I JUST TAKE SOME IN MY HANDS AFTER GRATING AND SQUEEZE HARD OVER THE SINK WORKS FOR ME. PS TO PREVIOUS COMMENT, I ALSO MIX IN SOME DRIED MINCED ONION FLAKES, HELPS ABSORB THE MOISTURE AND ADDS FLAVOR TOO. You can use a hand grater just as good..i then put my shredded potatoes in a small strainer which costs a 1.00 at dollar tree.and fold two paper towels on top until the juices are gone..
That’s precisely how I dried them, I used cup towel and squeezed over the sink until they were dry. I’ve used paper towels and found my potatoes were still too wet. (They tasted okay but not crispy). This recipe worked, perfectly crisp & easy! A clean dry kitchen towel works great, or a couple of layers of cheese cloth . Put potatoes in center, gather sides and ends of towel or cheese cloth and twist until no more water comes out. Sandra, I’m right with you and lack many cooking tool or special pots. Anyway, small kitchen adds to keeping frugal simplicity my #1 priority. Everyone finds what is best to use, but it’s more about adding “love” to whatever you cook or bake. Use your hands and squeeze out the starchy rinse water. Any oil that can go to a high temperature is fine and a bit of salt & pepper seasons just fine. Different types of potatoes have slightly different flavors but they are all good. Hope your hash browns turned out well I’m making some now to eat with some sautéed greens. Which kitchen oils can go to a high temperature and which cannot? Bran oil has a high temperature tolerance. I’m trying that. Have used a combination of methods, no ricer so just added small batches to a hand/kitchen/tea towel and squeezed. Once the batch was done I grabbed a fresh tea towel (that’s what we call it in Oz) and rolled it all up. And let it sit for a while. I make a lot of fish and chips and find that PEANUT OIL is best for me when frying potatoes with high heat. Hash browns included. Everyone forgets the simplest option: toss them underneathe the broiler or in a hot oven for 10-15 minutes. Make sure they’re all spread out and toss them once or twice and they’ll be good to go. An extra large nut milk bag also works to squeeze out the water really, really well also! Inexpensive and they waste far less paper towel. I used first a veggie strainer I had and then a dish towel (I’m also on disability)…and then spread out on cutting board for a little while while I prepared rest of meal. Fried up perfect from a raw potato. This looks like a great way to do it! However, let me offer this: microwave a potato for 3 or 4 minutes. Let it cool long enough so you can touch it (or if you’re antsy, just go for it!). Grate the cooked potato, and the proceed to fry it up. I use a cast iron skillet and lay a dinner plate over it, flip, and then slide it back in. You don’t need to squeeze out the water. The trick is to make them a little thinner – no more than about 1/4 inch layer in the pan – and use olive oil with a little butter mixed in. Cook them on very high heat as you say, and put the potatoes in the pan just as soon as you add the butter to the olive oil, the butter won’t turn brown, it will be nice and frothy. Wait until the potatoes are crispy around the edge, wait another 30 seconds, then flip. I have cast iron also but, for hash browns, I use a high-quality non-stick pan. I shake the pan back and forth to move the potato layer around and when ready flip like flipping a pancake. After flipping, let them fry for another 30-seconds to a minute then serve. Frozen OreIda hash browns from the store do just about as well. I do both depending. I still have an old salad spinner that works great to wick away the water. I first rinse them in cold water rinsing away the starch from the potato. Then I strain as much of the water away as I can then plop them in the salad spinner. A few high speed spins and I’ve got perfect grated, nearly dry potatoes ready for the oil. Makes great crispy hash browns. GLAD SOMEBODY FINALLY TOLD THE DIFFERENCE BETWEEN HOME FRIES AND HASH BROWNS. HAVE BEEN TRYING TO GET MESSAGE ACROSS TO MY SERVER AT REGULAR BREAKFAST PLACE.